Nadia Baiardi (aka NadiaSK) is one of the most famous Italian cosplayer. Italian representative at World Cosplay Summit 2008. She won the 3rd prize on Cosplay World Master 2011 and the 1st prize on Cosplay World Master 2012. 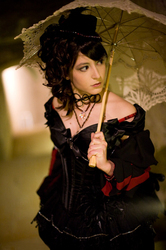 In July 2012, she won 3rd prize at European Cosplay Gathering as Italian representative at Japan Expo in Paris. She was invited to several countries as guest for her cosplay, for example: TNT in Mexico, Connichi in German, J-Popcon in Denmark, IberAnime in Lisbon, SICAF in South Korea and China, Otakuthon in Canada, Made in Japan in Austria, Salon de Manga in Barcelona and several others. In everyday life she is a fashion stylist and image consultant. She works for fashion magazines. NadiaSK loves traveling, reading, writing, and video games (mostly Final Fantasy, Soul Calibur, Prof Layton, and Alice in Madness). She also won several literary awards at national level. Visit her website www.nadiask.com or Facebook page to learn more.